Emergency dental work is never planned. Often times when emergency dental work is needed you are not prepared. Not all dentists offer emergency dental care in Prescott, AZ or are a 24 hour dentist. A dental emergency in Prescott, AZ can be anything from a broken tooth, something stuck in your teeth, pain, or an emergency tooth extraction. These things can happen at any time and you might not be able to see your regular dentist for the emergency dental care. Choosing the right walk in dentist in Prescott, AZ is important when you find yourself in this situation. Getting prompt and proper care is vital. When you are in need of urgent dental care you might not be in the right mind to carefully choose the proper urgent dental care. You might be alone and worried. We are helping to take the difficulties and stress out of choosing a 24 hour dentist in Prescott, AZ. Imagine, you are alone in the middle of the night. You get out of bed to use the restroom. It is dark and you trip over your dog. You fall hard and break a tooth. This just cannot wait until morning. Feeling shaken and shocked you know you need urgent dental care in Prescott, AZ. This is where we come in! 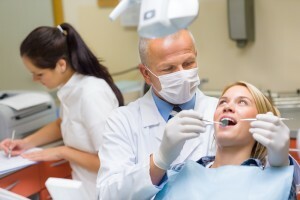 We have taken the guess work out of finding a quality 24 hour dentist in Prescott, AZ. This list below is a tool we have created for you to trust in when you need the best 24 hour dentist in Prescott, AZ. Rely on us in your time of need. Description Call our Prescott referral service Emergency Dentists USA phone number and get connected to an emergency dentist in Prescott, AZ in seconds! We provide a service that will get you to the dentist that fastest and easiest way possible, you can call us 24 hours a day, 7 days a week and its 100% free! Dr. Stephen Brown, DDS, Dr. Julie Cutler, DMD, Dr. Joseph Capps, DMD and Dr. Rodney Jay Brimhall, DMD MS lead a stron team at Prescott Modern Dentistry. The doctors combined have decades of experience that you can trust. They combine passion, technology and compassion to offer their patients the best treatment possible. They offer coupons for cleanings and payment plans for more expensive procedures. They also serve as an emergency dental clinic in Prescott, AZ. They ask that you call before arriving with your dental emergency. Their website also offers tips for dealing with dental emergencies and how to judge if it is a true dental emergency. They offer ways you can sometimes solve your own dental emergency. Their compassion and experience make this office one you can trust as your 24 hour dentist in Prescott, AZ. Dr. James Spurgeon, DDS has become one of the most trusted sedation dentists. He leads his team with care and compassion for the patients. The office strives on offering comfortable and stress free treatments to their patients. They also offer payment plans as well as a free exam and x rays proving they care about their patients dental health. In your time of need during a dental emergency in Prescott, AZ you can trust Dr. Spurgeon and his team. Be sure to call the office if your dental emergency is not during Prescott Dental Center’s normal hours of operation. Dr. Kristin Steele, DMD and her team at Gentle Dental aim to provide all patients with worry free comfortable treatments. They accept most dental plans and also offer payment plans for treatments so they can help more patients. They offer general dentistry, cosmetic dentistry, orthodontics and dental implants. The experience and truly caring service offered at Gentle Dental makes them a great choice. Call if your emergency is not during normal hours of operation. There is no way to truly be ready for your emergency dental visit in Prescott, AZ but there are ways to be more prepared. Utilize websites like that of Prescott Modern Dentistry to familiarize yourself with dental emergencies and ways to handle them. For instance knowing that food stuck in your teeth is not a true emergency. However, you can try tying a knot in dental floss as another method to fix this issue. For a broken tooth you want to clean the tooth and stop any bleeding before making your way to an emergency dentist in Prescott, AZ. You should also know when it is a true emergency that requires a trip to the emergency room. Examples are a broken jaw or inhaling an appliance. These require hospital care. Remain calm and call the office you are going to visit. Most times there is an on call dentist and they need to be alerted of your condition and get to the office. Have identification and your insurance information. If possible, have someone drive you to the office. Choosing the right walk in urgent care dentist in Prescott, AZ is important. This may be a new dentist that you have not met before. In your time of need you will want someone you can trust. Familiarizing yourself with the emergency dentists in Prescott, AZ prior to a dental emergency can ease some of the panic you may feel during the dental emergency in Prescott, AZ. The above offices offer care you can trust. Allow us to assist you in choosing the right emergency dentist in Prescott, AZ.